The weekend began with a Welcome Reception on Friday night featuring a well-known San Francisco Improv group "End Games". The group performed Improv on stage and then had attendees break out into groups where they played interactive games. This allowed participants to meet others in a fun way! On Saturday morning, the Third Annual Day of Service began where volunteers built hygiene packets for the homeless that were distributed in the Community. The weekend continued with optional events such as a Scavenger Hunt around Downtown San Francisco led by "Clash" and a Wine Tasting event by "Patel Vineyard". The conference went on with educational panels which featured doctors, matchmakers and subject matter experts. One speaker was Comedian Rajiv Satyal who stated "I had a great time at NetIP, I participated in a panel, recorded a podcast with two working actors in LA, and headlined the Closing Night Gala. I feel that NetIP and I have been building a symbiotic relationship for years and that was the culmination of it. It continues as NetIP LA/OC is sponsoring my one-man show. 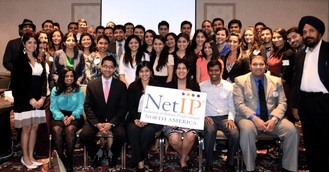 I truly appreciate the support of NetIP and its members". night continued with a fashion runway show displaying chic styles from CBAZAAR.